The Hulk roller-coaster towers over the Marvel area in the Islands of Adventure side of the theme park. You can hear the thrilling screams of fun as you cross into the area. Dr. Dooms Fearfall towers over the park. On the other side of the area, you can ride with dragons and hippogriffs in the Wizarding World of Harry Potter: Hogsmeade. You can also take your teens on an “adrenaline pumping and music thumping” ride on Hollywood Rip Ride Rockit on the Universal Studios side. The theme park is full of action with more than 25 different rides and attractions. But what about entertainment for the tinier tots? Universal has that too! Toddlers aren’t forgotten in the fun. There are many areas dedicated to younger children. When Universal provided me with an opportunity to enjoy the park, I was thrilled with the chance to discover why it truly is the ultimate vacation destination for all families. 1.Dr. Seuss’ Landing is a prime area for kiddos that translates well for the adults. One of the first books I read on my own was ‘Cat in the Hat‘. The ride is tame but still incorporates spins and fun-sized thrills with the story at the heart of the attraction. There is 36″ height limitation, and the child must sit on the bench-style seat. 2. One Fish, Two Fish, Red Fish, Blue Fish incorporates flying fish kids can control as you whirl around and try to avoid the splashes of looming fountains that squirt in time to a musical rhyme. 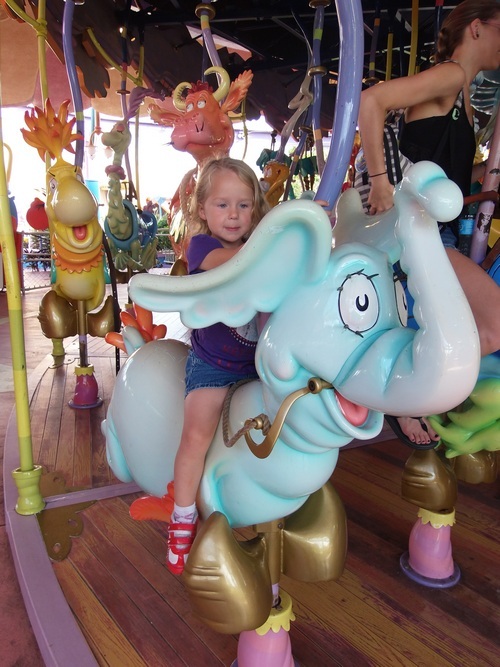 The Caro-Seuss-el is another toddler-friendly ride that doesn’t have a height limitation. If you need a stationary seat, there are whimsical options packed with Seuss’ charm. There was only one ride my just-turned-3 toddler was too tiny to ride with a restriction of 40″ tall- The High in the Sky Seuss Trolley Train Ride. It’s an attractive adventure that packs all the Seuss stories into one ride. 3. Make sure you locate the board with Story Times. Here, you will be able to meet-and-greet with characters like The Cat in the Hat and The Grinch. 4. The Marvel area has an adventure that might be for the braver tots. If your child was tall enough for the The High in the Sky Seuss Trolley Train Ride, then they are tall enough for the The Amazing Adventures of Spider-Man. 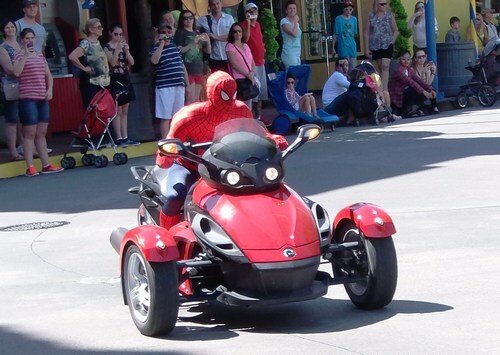 Passengers sit in an enclosed car and go on an adventure with Spider-Man. Be warned the action is on the intense-side with a virtual 400 foot freefall experience that feels incredibly real. 5. If you are looking for something tamer than Spider-Man’s ride, try Storm Force Accelatron. It will spin you around to dizzying whirling and twirling levels, but it has no height restrictions. 6. During my visit, the meet-and-greets were hourly. Check with an employee in the area for times. When you hear speakers announcing the detection of a classic Marvel villains, you have 10 minutes before the heroes will arrive on motor bikes and disperse for photo ops. 7. Pteranodon Flyers encourages parents to join their children on this flying adventure. Note that it is designed for children 36″ to 56″ in height. Guests over 56″ in height must be accompanied by a child meeting the 36″ height requirement. Children between 36″-56″ must be accompanied by a Supervising Companion. 8. Camp Jurassic is a prehistoric playground that is filled with climbing adventures. (I’d suggest avoiding the caves if darker areas is a concern.) However, my trio LOVED the Jurassic Park Discovery Center. 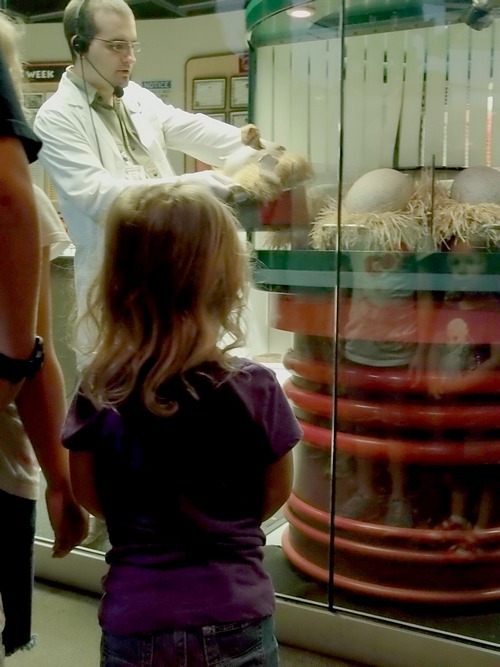 There, we witnessed the hatching of a tiny Velociraptor. When asked who wanted to name the new addition, my son’s hand shot into the air. He named the creature “Jeff” and was awarded with a Certificate of Birth featuring Jeff’s hatching details. It’s now a coveted souvenir and memory. 9. Over at Toon Lagoon, let your kids run free at Me Ship, The Olive. It’s got a bit of everything including slides, bells, whistles and nets to climb. 10. For tots who love Harry Potter, don’t miss the Triwizard Spirit Rally. It’s little show your tot can watch from their stroller while eating some Strawberry and Peanut Butter ice cream. 11. Shop windows in Hogsmeade are so imaginative and usually have something going on. Stop by the shop near the Owlry to see a Howler in action. Step inside Dervish and Banges to visit The Monster Book of Monsters and see if it lives up to its reputation. Also make sure you witness the wand choosing the wizard in Ollivanders. If you decide to purchase a wand, look for interactive places throughout the park to use it! 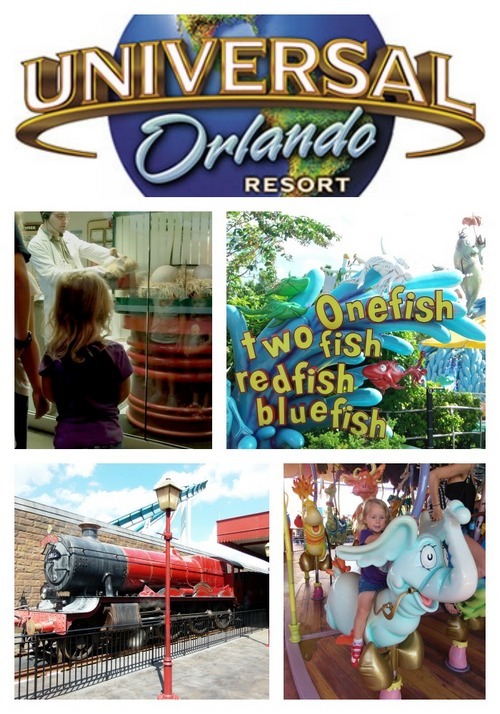 Home to Diagon Alley, the Studios side features an amazing array of toddler-approved choices. 12. 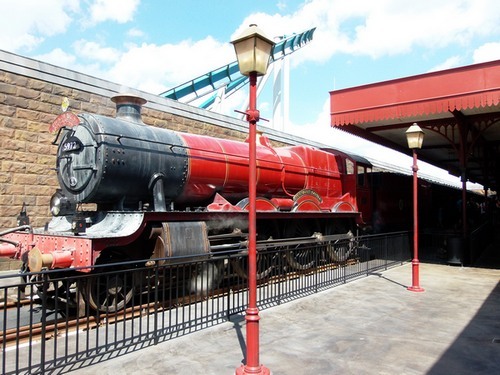 Take the Hogwarts Express to and from Diagon Alley. The ride is tame, but features thrilling moments from the books that Potter fans and non-Potter fans will enjoy. There are no height restrictions and easy to access for those with special needs. Make sure you ride the train both ways, as a different experience awaits you on the trips. 13. Once in Diagon Alley, take the many areas you can use the interactive wand purchased at Ollivanders. Hot Tip: There are two extra places not included on the maps that come with the wand. See if you can find them on your own, or ask a witch or wizard for a hint. 14. Despicable Me Minion Mayhem ride has a height restriction of 40″, but you can take smaller children on the “stationary seat”. The will get glasses and be a part of the show, but stay safe in a non-moving seat. 15. Shrek 4-D isn’t technically a ride, but you will feel like you are on one! With no height restriction, everyone will enjoy this extended tale. 16. E.T. Adventure is a classic that is easy-going and fun. Hope on a trolley of bikes and enjoy visiting E.T.’s colorful home planet. Height restriction is set at 34″ but there is zero-fear factor. 17. Kang & Kodos’ Twirl ‘n’ Hurl located in the Simpson’s area will remind you of One Fish, Two Fish, Red Fish, Blue Fish, but set to the zany Simpson’s theme. 18. The Simpson’s Ride required riders to be at least 40″ tall. This is another ride I’d suggest using parental discretion. The storyline might be a bit intense as Side Show Bob returns. 19. The Shows are plentiful on this side of the fun. Hit Animal Actors on Location, A Day in the Park With Barney and Beetlejuice’s Graveyard Revue. 20. Woody Woodpecker’s Nuthouse Coaster – At a needed height of 36″ or more, this kiddie coaster is just the right amount of speed and fun. 21. Curious George Goes To Town is a water-filled area that is great for an end-of-the-day treat. It’s cooling and fun with ample amounts of opportunities to get wet. If you rather stay dry, enjoy the Man in the Big Yellow Hat’s Ball Factory. There you will get to vacuum up soft, squishy balls and watch them dump from tubs overhead. You can also shoot them from little cannons from the second story of fun. 22. Fievel’s Playland was dear to my heart as it was my favorite movie as a child. Some might not recognize the classic cartoon, but the fun for wee ones is well received. Kids can explore a 30-foot spider web, enjoy tin cans to crawl through, and fall in love with a twisting, turning 200-foot long water slide that won’t get tots too wet. Universal aims to keep lines interactive to hold children’s attention while they wait? Every ride has a Child Swap Option so every member of the family gets a chance to ride? If your child isn’t tall enough to go on a ride, ask for a “Height Certificate”. It will allow the child a one-time complimentary Express Pass line for that ride. When the are tall enough, they can return to the specific ride and skip the line! Disclosure – Any and all opinions expressed are that of CelebBabyLaundry.com. No compensation was received, however the experience was provided by Universal Orlando.